But here's the irony: Even with all the data we can access on digital consumption, we still know less about our digital audience than our broadcast audience. Frankly, there's so much data to look at, it's much harder to know which numbers really matter and what to do with them. This, in a nutshell, is what gave birth to the Analytics Service from NPR Digital Services. Our mission is to support stations by making data and insights more accessible, relevant, and actionable. We want to make it easier for you to track your digital performance and growth, test ideas and content, and make data-informed decisions on your digital strategy, editorial content, and online investments. In addition, the Analytics Service provides a system-wide perspective of public media through universal measurement. When everyone works together on collective metrics and we look at our overall impact online, it tells an impressive story of the power of public media. The biggest signal of this impact so far is our position on Triton Digital Media's top 20 list of US streamers. Even as we continue to add stations to Triton's streaming measurement service, we are already #6 in the country. We are a force to be reckoned with, not just on air but online as well. We are also committed to using this collective data to identify trends and insights we can all benefit from - everything from site optimization tests during pledge drives to data-driven insights on what types of content perform best on homepages. Those of you who attended NPR Digital Day in Austin in March might recall my presentation on digital listening trends across public radio, where for the first time we identified larger, system-wide trends in online audience reach and listening time. It's exactly this type of analysis that we are committed to extending as more and more stations participate in the Analytics Service. Makes access to digital metrics easier by aggregating data from multiple sources: Google Analytics for site metrics and Triton for streaming metrics. Improves the accuracy and relevance of data through our custom site tagging, which provides advanced tracking not included in Google's standard tag. Provides dashboards that show the metrics that matter most for public media, so you can track audience growth, engagement, top-performing content, and site activities. Enables you to compare your station with the entire system or with other stations like you, based on station attributes you choose. Over 150 stations are already using the Station Analytics System to better measure their sites and streams. If you want to learn more, watch the video tour below or head over to the Digital Services site for the steps to get started. Contact your Station Relations Manager or email us anytime at info@ds.npr.org and tell us how we can better support you with analytics training, data, or insights. 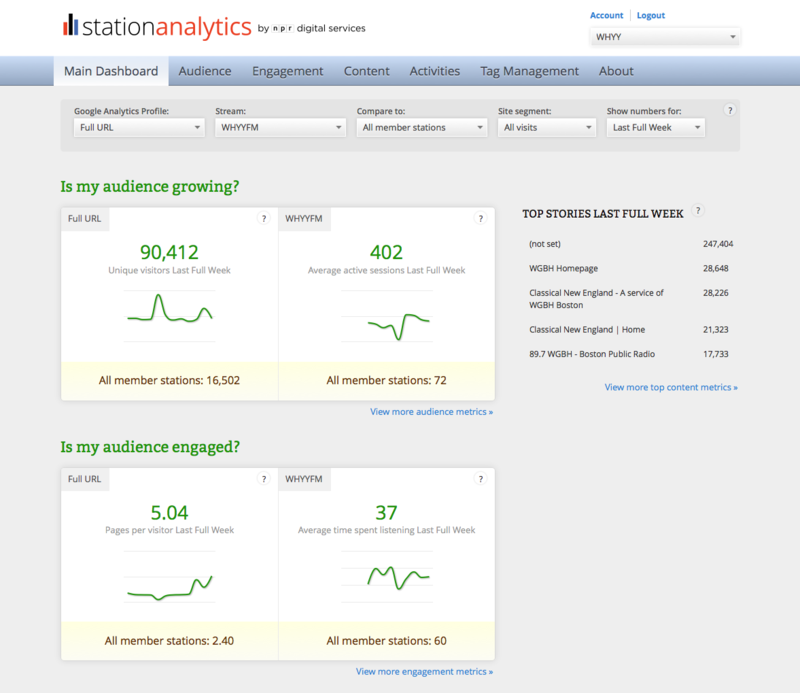 At last count we have over 150 stations using the NPR Digital Services Station Analytics System. These stations are taking advantage of a customized tag that includes Google Analytics tracking and Chartbeat, as well as the ability to easily add event and custom variable tracking. They also have access to dashboards that pull data from multiple sources - including Google Analytics and Triton Webcast Metrics. If you haven't yet signed to use our custom Tag Management and Dashboarding system here are some great resources to help you get started.